06-05-2018 Animal Markets Morocco Created by Animals' Angels e. V.
Our Moroccan team visits the donkeys and horses at Skherat animal market. 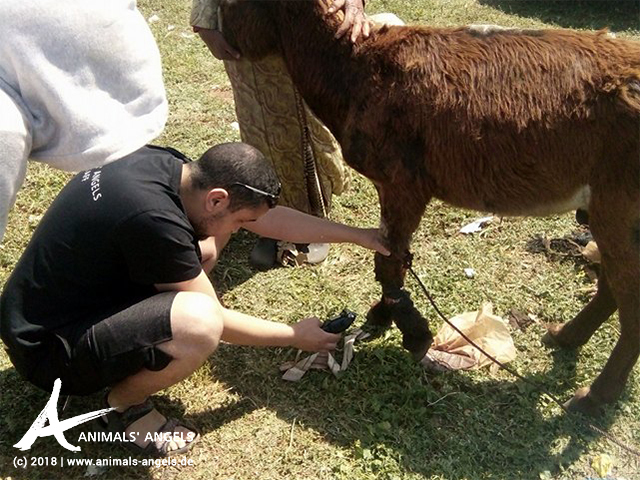 During their walk over the market, they spot two donkeys having some bald spots and suffering from skin disorder. They provide them makeshift care with some ointment and talk to their owner who is very thankful for their help. All too often, we meet owners lacking not only any understanding for their animals, but also money to visit a vet. Afterwards, Habib and Boubaker spot a horse with very bad hooves. They talk to his owner, and at least, he understands and immediately searches for a blacksmith at the market. His horse gets shod while our team is present. At the end, our team unburdens and unsaddles some donkeys and gives them water which they accept thankfully.